I am deeply saddened to tell you my sweet, precious Grrreta has passed away from complications of feline diabetes. She had lost weight, her body had been reacting badly to insulin injections, and yesterday she suffered a seizure that took her life. I will always cherish the sweet, wonderful memories of the eight years she was part of our family. She filled every moment with joy and love, and was loved more than I ever imagined possible. I miss her more than words can express. We are so deeply sorry, beyond any words. Please know we're keeping you in our thoughts and prayers, sending purrs and universal healing Light for your grief. I'm sorry for your loss. Thank you for sharing 8 wonderful years with Greta. Wasn't she from a gas station? **two cats living in Korea - Sophie and Ddalgi. Sophie was born in Manhattan but moved to California after two years and now lives in Korea. Ddalgi was born here. They are both former ferals. We are so sorry to learn this. Sending our condolences from all of us at Purrchance To Dream. We are very sorry to hear about Grrreta. Our purrs. Oh my gosh... I'm so sorry to hear this. She will always hold a soft spot in my heart. 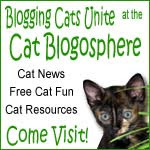 We don't cat blog anymore but I just saw an update on the CB page on facebook. big hugs from me and gentle purrs from the Gs. We are so sorry for your loss! Grrreta was so lucky to have you. I can tell you loved her very much. (((hugs))) to you. I am so sorry to hear this. We always loved her from afar. Parker was there to greet her, I am sure. We are so saddened to hear this, and are sending you a whole lot of kitty hugs and purrs...diabetes is awful. Godspeed Grrreta, we will miss you, lots. We're so sorry to hear about Grrreta. Our thoughts and prayers are with you. We know how bad it hurts to lose a furry loved one but the pain can never, ever take away the love she brought to your heart. Sending many purrs and hugs. I was so sad to read about Grrreta over at the Cat Blogosphere. Purrs to you. It is so heart-breaking to lose a kitty. We are so sorry to hear your sad news. We send you hugs and purrs. Oh no, Michelle, mom's heart hurts for you. We are so sorry to read this news. Mom has been so busy she had not had time to reply to your last email. Sending you big (((hugs))) and purrs. The Ballicai and I are so sorry to hear this news. We are sending lots of love, hugs, and purrs. Grrreta was so loved, and she will be so missed. Our hearts are with you at this difficult time. We are so very, very sorry for your loss. Our prayers are with you and we hope the joy of your many years together will always comfort you. We are so very sorry for the loss of your beautiful girl. Purrs and hugs coming your way. Oh no, we are so so sorry about Grrreta. This makes us so sad and we know you are heart broken too. We sure do send you tons of purrs and many prayers and big hugs to the Mom bean. it is so darn hard to lose our babies. Thinking about you. Take care. Surrounding you and your family with Reiki light in this time of mourning. Sweet dreams Grrreta. Oh no! We are so sorry to hear this. We send you comforting purrs and headbutts. RIP, sweet Grrreta...we will miss you very much. We are so very sorry that sweet Grrreta had to go to the Bridge. Thank you for loving her so very much. Big hugs, purrs and prayers coming your way, dear friends. We are so sorry that Grrreta has crossed over. But now she is running free and having fun with those who have crossed before. Many purrs and purrayers and hugs to you during this very difficult time. We were so saddened to read that beautiful, sweet Grrreta had gone to the Bridge. We can imagine your pain and how much you will miss your girl. We are all so very, very sorry to hear that sad news. We all loved that girl and we are thankful that you shared her with all of us. Run free dear Grrreta, run free. All our love, purrs and hugs. Brian, Sascha, Gracie, Zoe, Dolly, Precious, Kit, Dad and Mom. So sorry to hear about the loss of your sweetie, we know that you loved her so much. You were so lucky to have 8 wonderful years together. Oh, no, I am so sorry for your loss. I really loved to read Grrreta's blog. There are never words to help at such a time. Sending hugs, purrs and pawtaps from me and the Funny Farmers. We are so sad to read this news, and so very sorry for your loss. Many purrs for you in this difficult time. I am so sorry to read of your loss. Grrreta did not have an easy start in life but you gave her so much love and happiness I know she loved every moment with you. Hugs and soft purrs to help ease your heavy heart. We're so sorry to hear the sad news about Grrreta, and we send comforting vibes and purrayers for your loss. You will always have many good memories of her. Oh noes, this is so sad to hear. Miss grrreta will be missed. We can only imagine your sorrow and grief. Purrs to you. We are so very sorry for your loss. We didn't know sweet Grreta but we would have loved her. Purrs and gentle hugs to you. We here at the Manx kitties house are all so sad to hear of your great loss. Beautiful Greta will be missed by all of her fur friends in the CB. We will light our candle in her memory tonight. Hugs and purrs to you and our deepest sympathy. We are so sorry that your beautiful girl has left you and send gentle purrs and headbumps. We are so sorry to hear of Grrreta going to the Rainbow bridge!! We shall miss her!! Lots of hugs and prayers for you! You have our heartfelt sympathies! So sorry to hear about your pretty girl. Sending whisker kisses and soft purrs from all of us at Prancer Pie. We are so sorry sweet Grreta had to run off to the bridge. We are sending you all our hugs and purrs. We are so sorry to hear this news. We are keeping you in our hearts & prayers. Michelle, I'm so sorry to hear about Grrreta. I know she had a wonderful life with you. I'm so sorry about Grrreta. I send warm purrs to comfort you in this difficult time. We are so sorry to learn that beautiful Grrreta has gone to The Bridge. She was a very special girl and we know how much you loved her. May good memories soon fill the gap she has left behind. Oh no! We just heard the sad news. Grrreta was such a special friend. We know how difficult managing diabetes can be. This happened to our Maxfield...he didn't adjust well to the insulin and he too had a seizure that took his life. It's so difficult. We are surrounding you with lots of purrs. Grrreta had such a good life with you. We were so very sorry to read that your precious Grrreta had to leave for The Bridge. Soar with the angels sweet girl, we will see you again. We saw your comment at Chey's and had to come over to say how sorry we are that Grrreta has gone to the Bridge. We send comforting purrs as we know you will miss your beautiful girl. I send love and purrs and comfort on the loss of your furbaby, Grrreta. A beautiful little girl, so much loved by her family. The best thing to remember is that she was happy while with you and loved you too..just as much. She will be waiting for you when you meet again by and by. We all of us here know the pain and sorrow. Warm hugs. Gosspeed darling little one and I willlook for your sparkling star this very night. We are so sorry for your loss and are purring for all of Grrreta's loved ones left behind. Our deepest condolences. We are so sorry to hear of your loss. 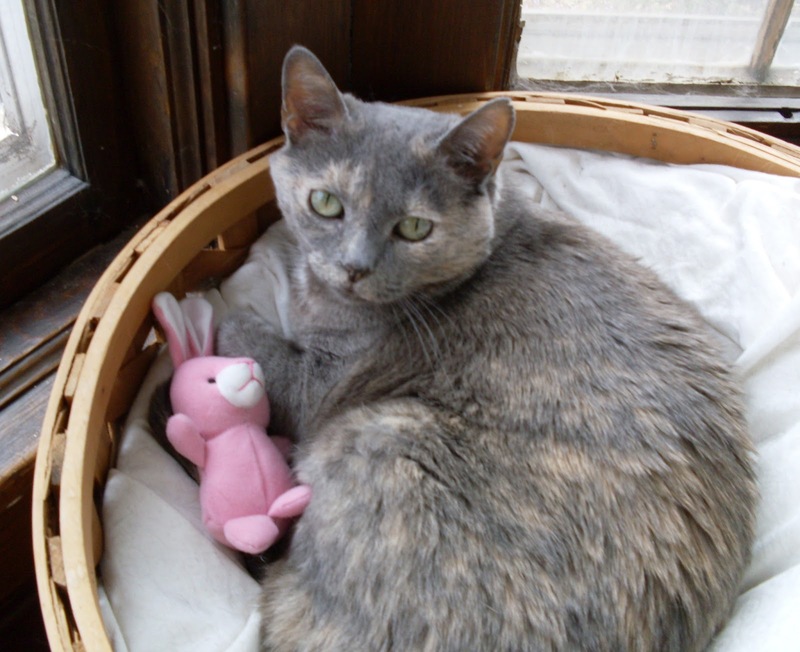 Sweet Greta was a funny and wonderful girl and you gave her a happy, happy life. We will all miss her. Gray babies are the best my Human says, thinking of her lovely Mr. Teeth who no doubt greeted Greta as she crossed the Bridge. We are visiting from Alasandra's blog. We are sad to hear about Grrreta's death. We know she'll have a wonderful welcoming at the Rainbow Bridge. Purrs and hugs from our house. We're so very sorry to hear about Grrreta. She will always be safe in the hearts of those who loved her. Very sorry to hear about Grrreta. Sending soft purrs to help comfort you during this sad time. Just stopping by again hoping things are a little better. We thank you for your words of comfort for our Chica. Hope Grrreta and Chica are playing together at the Bridge. We are so very sad to hear about precious Grrreta. Please know you are in our thoughts during this very sad time. My heart is heavy as I have just learned that sweet Grrreta has gone to the bridge. Keep her close to you in your thoughts and heart. Know that someday you will meet again. We are so sorry to hear the sad news. Our Mistrie Rose is very ill right now as well. We lost our Patches over two years ago and the pain still lingers.....they are so precious, so loved and so missed. We haven't met, but we wanted to send our deepest sympathies on the loss of your beautiful Grrreta. I am so sorry to hear the sad news. But what a lucky lady-cat she was to have you as her mom. My vet once told me that over 85% of diabetic cats are put to sleep because of expense and 'inconvenience'. I'm sure she had a wonderful life with you. You are in my prayers in the coming days. Mom and I are so very sorry to read about Grreta...what a beautiful lady she was....run free sweetie and may you find lots of butterflies at the bridge. We are so sorry to hear that Grrreta has gone to the bridge, our mom knows how hard diabetes can be on a soul. We hope that you remember that she is now running around, healthy and without pain and is waiting in your heart until you meet again. Grrreta was one of my very first bloggy friends. Thank you for sharing her with us. Rest with the angels, sweetheart, you have earned your wings. Just wanted to come back over because we were thinking of you. We hope you are ok, and we are sending more purrs and (((hugs))) from all of us. I didn't know Grrreta but I know how much it hurts. I am so sorry Grrreta has crossed the Rinbow Bridge. She will be watching over you from above. Lots and lots of purrs and hugs. We are so very sorry for your loss. Sending hugs and prayers. We are so very sorry to hear of Grrreta's passing. She was a sweet little girlie and will be missed greatly. Purrs and hugs to you all. So sorry to hear this news. Sending lots of hugs and purrrrrrrrrrs from the Hotties kitties. I am so very sorry that Grrreta had to leave for the Rainbow Bridge. I loved reading about her and know how much you loved her. We haven't been blogging for a few weeks and are only catching up with your sad news. We are so very sorry to hear that Grrreta has crossed over the Rainbow Bridge. May your sweet memories of her comfort you. we are so deeply sorry! lovely grrreta had eight precious wonderful years with you - but we know how hard it is for us who are left behind. thinking of you and sending loving purrs! I am so, so very sorry to hear about Grrreta. I use to follow Grrreta all the time when I had the animals blog still up. I lost Skitto (18 years old), and she went over the rainbow bridge right before Christmas. I know it hurts like heck and my thoughts and purrs are with you all honey I am so sorry Michelle, God bless you sweetheart, my heart breaks for you. So very sorry to hear your sad news about Grrreta. You are in our thoughts. We are so very sorry. Grrreta was one of our very first blogging friends, and one of our most favourite to visit. Fly free, special girl. You were a very good cat. Lissa, Fui, Suey and Lishy. I am sorry. Rest in peace. I am so very sorry for your loss! My Kodak had feline diabetes as well. May Grrreta be surrounded by lots of friends at the Rainbow Bridge! We are so very sorry for your loss. Rest in Peace sweet Grrreta! We are so sorry to hear the sad news of Grrreta's passing. Sending you hugs and purrs and hope they will help even a little.